Damien joined Year Here after a decade at leading branding and advertising agencies in London and Sydney. He has worked a long list of clients, from Grey Goose vodka to the Sydney Symphony Orchestra – and in all shapes and sizes, from multinational FMCG brands to scrappy challenger start-ups. His introduction to the world of social enterprises began with a partnership with OzHarvest, an Australian food rescue venture (did you know 1 in 5 bags of groceries are sent to landfill? ), which continued to grow his interest in the space before he joined Year Here to manage communications and brand. 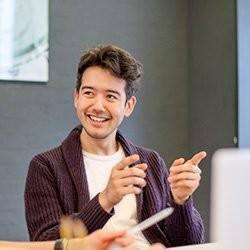 Damien is also a strategist and copywriter for Luka, a boutique branding consultancy that provides big agency strategy and creativity to emerging for-purpose businesses. In his spare time he continues a tireless quest for the perfect ramen.